Many of these earlier posts first appeared on another blog I have called, “Kali’s Musings,” that explores the parallels between parenting and management, along with some personal life writing. If you are interested in those topics, feel free to check in! 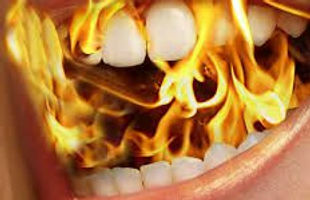 Burning Mouth Syndrome (BMS) entered my life for the first time in 2006. I had dental work on my two front teeth and woke soon after with burning in my mouth and throat. It did not affect my tongue at that time. After visits to my Dentist and an Ear, Nose, and Throat doctor, they eventually tried an oral antibiotic and after four months of pain, I woke up my second day of antibiotic treatment with no pain whatsoever. Hallelujah! I assumed, as did my physicians, that the treatment had worked and whatever was infected was no longer a problem. We were all so wrong. I was simply in remission. In May of 2008, I was again having problems with my two front teeth, and it turned out I had many issues there that eventually led to an oral surgery and finally to extraction. But before all of that came about, on Mother’s Day I sang two concerts (I am a professional singer), and that night felt a little like I was coming down with something. “Fluish,” for lack of a better term. I ran a very low-grade fever and felt a little feverish, and when I awoke, the burning pain in my mouth and throat had returned. I recognized it immediately, of course, and contacted my family doctor for the antibiotic that had worked two years earlier. She was very helpful, and I started the next day. No dice after a complete treatment, and my second Burning Mouth Syndrome journey began and continues. Meanwhile, I was having the oral surgery, and then the extraction of my two front teeth and the nerves in my mouth and tongue were in overdrive. The tongue got involved with a vengeance and started burning in that familiar pattern of escalation throughout the day. You can read my posts on this blog, which give a somewhat chronological window into the life of a chronic pain sufferer. It’s not pretty, but it’s the truth. It is my hope that something in my journey will help you in yours if you are a sufferer or love someone who is.